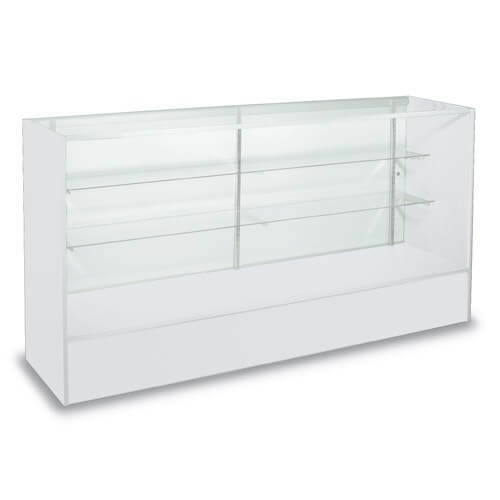 Our White 60 inch Full Vision Display Case will add a clean and crisp appeal to your showcasing exhibits. With the measurements being 60 inches wide and 38 inches high, this floor fixture is ideal when added to your current service areas or cash wraps. 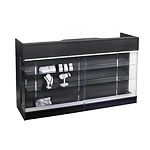 This full vision display case comes with wood trim and base is included. 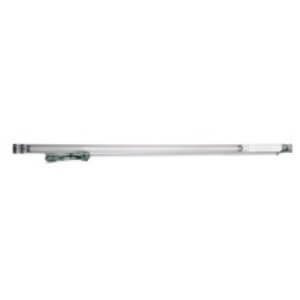 Adjustable sliding glass shelves are about 3/16 inches thick and come in two different depths of eight and ten inches deep. Makes staggering your shelves fun and economical. In the rear of this counter fixture are two wooden sliding doors making it easier on your help to achieve whats displayed inside. Give your business a fresh new look. Buy your white showcasing counter today!